I used SN pencils (no markers) and not too much blending for the foreground. I wanted to create an evening snowy sky and a soft look for the foreground. 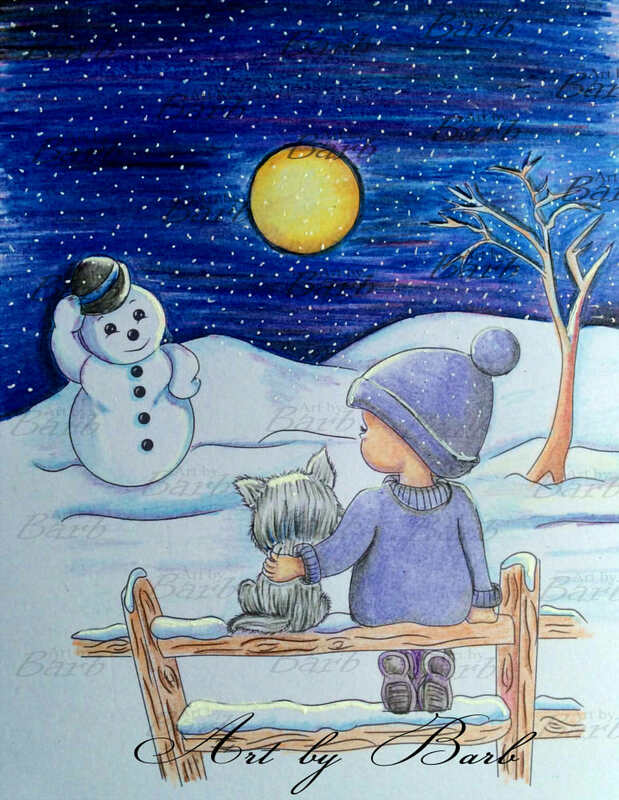 My thinking was that I could add more shadow to the snow if I was to create a dark sky and the snow falling would show better. Although, the darker the sky got, the more I worried for the child...sure that child should be tucked up in bed at that time of night!!! The sky was easy to do, I just scribbled across the page with pinks, purples and light blues until it blended itself. Used a really dark blue and black to add depth and interest. I was going to do the falling snow with white acrylic paint, but my daughter had used it and put it some place other than where I usually keep it (kids for you!) she was out and about, so had to use a gel pen, which worked! I used a light blue and lilac for the ground snow, never used a lilac before to add shade but it worked really well. The rest is self explanatory I think, the usual skin tones, browns for the fence and tree. Lilac and greys for the hat, jumper and pet. Pale yellows and a touch of light brown for the moon. Image is available as a digital stamp @ Art by Barb and we also have a few free image that you're welcome to download and colour. Love it. The sky is awesome and the snow on the posts.